Newspapers deal with legal questions on a daily basis. What about a threatened libel suit? Was a school board in an illegal executive session? Do you risk reader ire by running that accident scene photo? Our legal staff is here to help. Our staff attorneys answer questions and offer guidance through the Legal Hotline. Calls about the First Amendment, open meetings, open records, gag orders, subpoenas and more are free to all employees of member newspapers. You can also read online information on legal topics that affect newspapers. Among our Legal Publications, the online newspaper handbook addresses all newspaper legal topics. PNA works tirelessly for improved open meeting, open records and public notice laws. As part of our Government Affairs services, we monitor every bill going through the state capitol that could affect the way news is gathered, and we lobby in the best interest of the industry and the public. 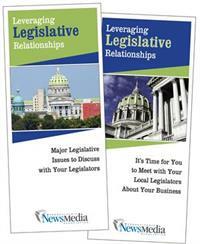 Legislators make key decisions about your business in Harrisburg. Developing ongoing relationships with your state elected officials and participating in legislative advocacy is an essential part of being an effective leader of a community newspaper. Here are two brochures with additional information. Check out this video featuring Auditor General, Eugene DePasquale and Senator Mike Folmer confirming why it is critical for you to have these relationships. There’s no better time to work on developing and improving connections with legislators. For further information, e-mail Holly.